Tales from the Den of Chaos: Um, question? ...why am I so easily amused?!?! You couldn't have grown that to plan if you'd tried. Well worth photographing for posterity. 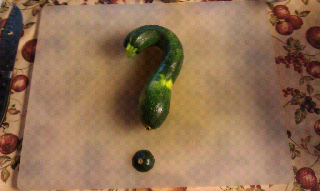 One of my colleagues gave me two huge zucchini (I think one was 2lb the other 1.5), which I processed on Tuesday night. A third of one was sliced and grilled for moussaka (used instead of eggplant). 8 bags of shreddings went into the freezer. The rest of the shreddings were added to the meat sauce I made for the moussaka bulking it up so much I had to freeze half (quantity unknown - it's just what wouldn't fit into the bowl I filled while I was batch shredding the stuff in the food processor). You mentioned using your dehydrator to process zucchini in your last post. Care to elaborate?